During the past 4 years, 483 Roux-en-Y gastric bypass operations were performed by two surgeons at a university hospital. All of these were performed laparoscopically, with retrogastric, retrocolic passage of the Roux limb to form the gastro-jejunostomy. Of those operations, 11 of them subsequently went on to develop internal hernias, for an internal hernia rate of 2.3%. Of these 11 patients, we classified them into 4 types. There were no internal hernias among these patients involving the mesenteric defect of the jejuno-jejunostomy. There were 3 internal hernias that developed as a result of herniation of small bowel through the tranverse colon mesenteric defect into the lesser sac. There were 4 hernias through Peterson’s defect, which allowed passage of small bowel posterior to the Roux limb mesentery. 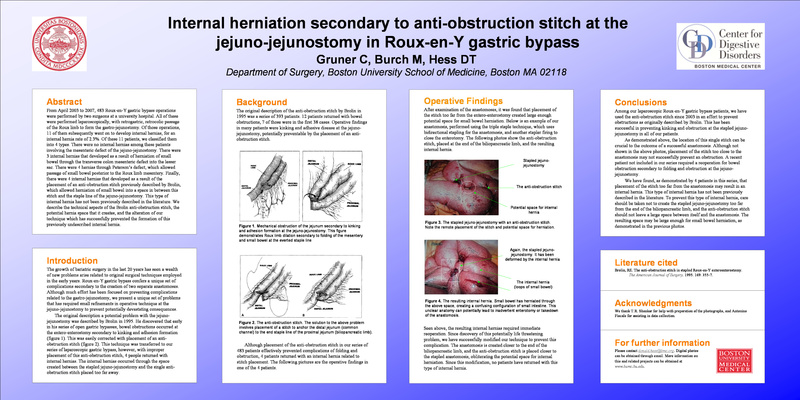 Finally, there were 4 internal hernias that developed as a result of the placement of an anti-obstruction stitch previously described by Brolin, which allowed herniation of small bowel into a space in between this stitch and the staple line of the jejuno-jejunostomy. This type of internal hernia has not been previously described in the literature. We describe the technical aspects of the Brolin anti-obstruction stitch, the potential hernia space that it creates, and the alteration of our technique which has successfully prevented the formation of this previously undescribed internal hernia.